A bagel is a bread product, traditionally shaped by hand into the form of a ring from yeasted wheat dough, roughly hand-sized, which is first boiled for a short time in water and then baked. The result is a dense, chewy, doughy interior with a browned and sometimes crisp exterior. 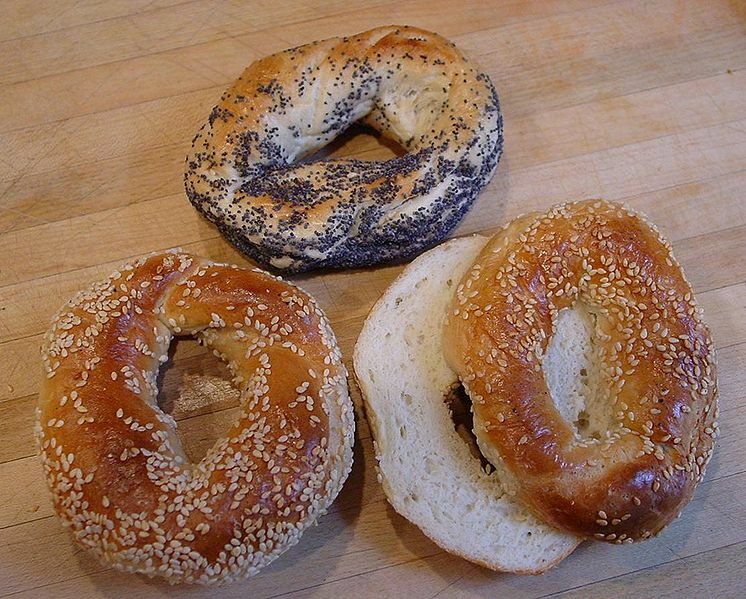 Left: Poppy and sesame bagels. Bagels have become a popular bread product in the United States, Canada and the United Kingdom, especially in cities with large Jewish populations, many with different ways of making bagels. Like other bakery products, bagels are available (either fresh or frozen, and often in many flavour varieties) in many major supermarkets in those countries. 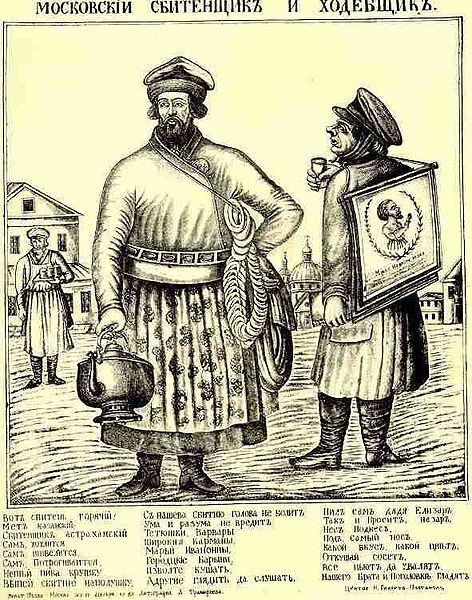 Left: A Russian street vendor (left of picture) selling Russian-style bagels: bubliks and baranki (19th century). Bagel was invented in Kraków, Poland, in the 16th century. There was a tradition among many observant Jewish families to make bagels on Saturday evenings at the conclusion of the Sabbath. Due to Jewish Sabbath restrictions, they were not permitted to cook during the period of the Sabbath and, compared with other types of bread, bagels could be baked very quickly as soon as it ended. Russian bubliks are very similar to bagels, but are somewhat bigger, have a wider hole, and are drier and chewier. Other ring-shaped breads known among East Slavs are baranki (smaller and drier) and sushki (even smaller and drier). At its most basic, traditional bagel dough contains wheat flour (without germ or bran), salt, water, and yeast leavening. Bread flour or other high gluten flours are preferred to create the firm and dense but spongy bagel shape and chewy texture. Most bagel recipes call for the addition of a sweetener to the dough, often barley malt (syrup or crystals), honey, sugar, with or without eggs, milk or butter. Leavening can be accomplished using either a sourdough technique or using commercially produced yeast. It is this unusual production method which is said to give bagels their distinctive taste, chewy texture, and shiny appearance.